“Oh, that’s impossible, I can’t do that!” This is what I would have said, if I had known what I was about to embark on beforehand. But I didn’t know. And so, when my daughter asked me to go with her to Patagonia, I agreed. Although this remote part of Argentina and Chile had never appeared in my travel imaginings, I knew that I was going on a 60 kilometre trek of medium difficulty over five days, and I knew I could do that. The American was right. The mountains of snow and ice, the blue lakes (paine is the native word for blue) and the painted skies were endless. Natural tracks that were not manicured but still safe and easy to follow, lead us around the mountains, through wooded areas and over trickling waterways. The sky was a great empty plain and we could hear the rumble of avalanches falling miles from where we stood. There is only one path to follow so it is impossible to get lost, and yet you have the sense that you are lost from the rest of the world. I am privileged to own such rare,unique moments. 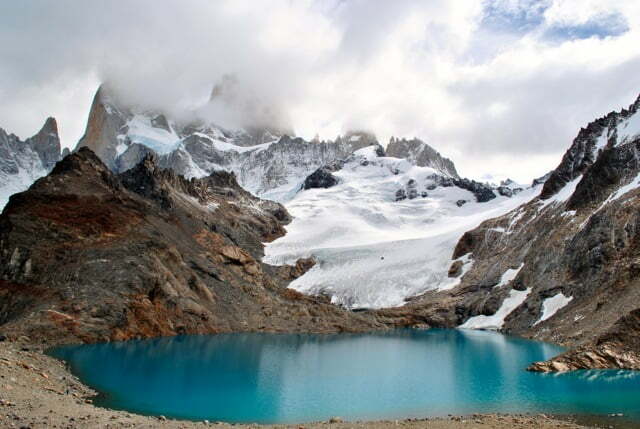 On the Torres del Paine trek you take a day to walk from refugio (lodge) to refugio. The path is well marked, and there is enough time to make the distance without having to hurry. You measure distance in time because the terrain has to be considered. Pre-booking is essential to make sure you get a bed, and we did all our booking from Australia. There are lots of companies online. I was unsure what to expect from the refugios as they are remote and Patagonia isn’t economically wealthy. We had dormitory sleeping arrangements and I hadn’t slept like that since I was young. But the lodging surprised me and it was always exciting to arrive at our new lodge, each one warmed by a stove and the sound of exhausted, hungry and happy trekkers. Food was delicious and ample, and we ate at long mess tables, so you always had company while dining. We collected a picnic lunch and snacks in the morning when leaving, which meant we only had to carry food for the day. I am in my mid-fifties and if referring to age and fitness, I was in a minority. Most of the trekkers were under thirty-five. Some were extremely fit and I swear some of the young men who galloped past us were cloven-footed, their feet barely hitting the ground. But there were still plenty like me, moderately fit and young at heart, and we managed steeps ascents and the distances. Perhaps it was the curiosity of what’s around the next corner that kept me going, but mostly my strength of mind compensated for my lack of physical strength, and meditating on the present kept ‘what if it’s too hard’ thoughts at bay. I would have liked to have been fitter. It may have made the difficult stretches easier, although I have no lasting ill effects on my knees or ankles! However, be aware that once you leave the drop-off point and head into the mountains, there is no vehicular access. If you injure yourself you will rely on the goodness of strangers to carry you out or on the availability of a donkey. While there are many welcome ‘alone’ times, you are never lonely. We met women travelling on their own, families, dads carrying their small children in backpacks. We met an artist returning after ten years; people of all ages from around the world. So many interesting people and conversations. Just when we thought it was safe to hang up our trekking shoes, we arrived by bus in El Chalten and Los Glaciares National Park – the trekking capital of the world. We hired a local taxi driver – enterprising young people use their own cars to provide a taxi service – to drive us out of town to a starting point for the Laguna los Tres hike. This day-long hike was the most difficult of all the hikes around El Chalten – but the most beautiful. At the bottom of the steep ascent to view FitzRoy Mount was a sign warning that only trekkers in top physical condition should attempt the climb. I knew by now that I always had one more step in me, so off we went. We climbed for an hour or so, the people on the rocky slopes ahead of us like a thin trail of ants. I treated it as sacred, my treading on the aloofness of mountains. We had expected strong winds and rain, which are daily occurrences in Patagonia, particularly in March. But the gods were smiling on us and we had still, sunny weather for four out of five days. It was cold but it was a clear sunlit cold that is ideal for trekking. And being cold means the paths and lodges are less crowded. Now back in Australia, I want my steps to stay slow, the silence of mountains to stay in my mind and their grandeur impressed on my imagination – and the impossible to remain possible. Jacinta Agostinelli is a Melbourne-based writer and editor. She enjoys spending time with her husband and five daughters, and travelling to far-away places.